Let me tell you about my office mate. To be honest, I can't tell you much. Not for privacy or security reasons, but simply because I don't really know her. What I *do* know, though, is that she really, really, really likes enchiladas. Either that, or it's just the only thing she knows how to cook. At least once a week, she tells me that she's making enchiladas that evening, that she put the chicken in the slow cooker this morning, and it's just so incredibly easy. After nine or ten weeks of hearing about enchiladas, I'd had enough. Needed to try them. I'd had a Weight Watchers frozen version back in Chicago - chicken enchiladas suiza - and wasn't thrilled ... mostly because after a few minutes in the microwave, the texture was too soggy in some places and oddly crunchy where it probably shouldn't have been. So for my second try, I decided to attempt making them. I wish I had a better picture, or even just a picture of them plated, but I made them last week with Justin and we were so hungry that it just completely slipped my mind. The "recipe" is fairly easy. I shredded a medium zucchini and tossed it together with half a can of no salt added black beans (rinsed and drained) and half a can of Mexicorn (it's corn with peppers in it - plain corn would work just fine, though), and some cumin and cayenne pepper to suit your taste. 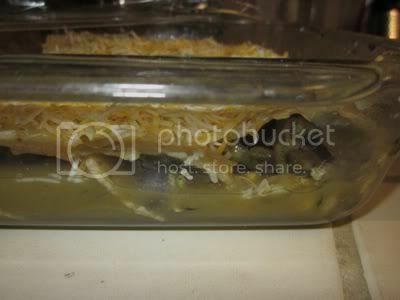 I put about a cup of green enchilada sauce in the bottom of an 8x8" glass baking dish. Then I took five medium-sized tortillas and (one at a time) microwaved them for 10-15 seconds to ease rolling. I put a bunch of the veggie mixture in them, rolled them up, and put them seam-side-down in the baking dish. Then I added another 1 1/2 cups of enchilada sauce over the top and sprinkled a cup of shredded colby jack cheese over the top. Bake at 375º F for 10-15 minutes, just until the cheese is melted and the enchiladas are heated through. They were quite delicious. The tortillas are traditionally corn, and since corn tortillas fall apart very easily when bent, you fry them first. Since I had absolutely no intention of frying anything, I used Mission brand Artisan Corn and Whole Wheat blend tortillas - they're only 90 calories each and after a quick microwaving, they rolled with no issues. The enchilada sauce was a little salty for my taste, which is why I went with the no salt beans. Justin said they were a bit spicy, which I blamed on the Mexicorn and not on my tendency to be heavy handed with the spices. Definitely a keeper recipe, though there was certainly room for improvement - not to mention infinite other filling possibilities! What about you? What is your favorite ethnic cuisine? Is there anything you make at least once a week like my office mate? Sounds like a nice, healthy meal. That looks like a healthy and simple recipe. Glad you enjoyed it. You're right on the frozen enchiladas - they're just plain weird. I make a lot of soups to get me by. It lasts a few days. I just vary the ingredients each time. It's great for cold weather and I can control the ingredients, especially amount of SALT that goes into it. Canned soups have so much sodium it's unreal. I love enchiladas. My favorite way to make them is shredded chicken with refried black beans, and spanish rice. Then cheese. I like the red sauce better than the green. I cook up the chicken with onion and green bell pepper and put taco seasoning on it. I definitely recommend getting a slow cooker- not for this, but for other items. Chili, stews, soups, etc its a very important thing to have. i'd rather have a slow cooker than an oven.